The Year of the Potato. That sounds rather dramatic, doesn't it? Well, in fact, it is. I learned only today that the United Nations has named 2008 the Year of the Potato in an effort to highlight the potato's benefits in reducing global poverty. I wanted to do a feature here on this blog because I think one of the main lessons I've learned from Martha has been the notion of agricultural sustainability and the promotion of a cooperative way of developing healthy crops, on a local level, to help feed a community, whether it is on a private farm or as part of a larger community. I was encouraged and surprised to learn just how effective potatoes could potentially be in bringing struggling communities into stronger social positions. It is the potato's ability to grow just about everywhere that makes it a prime candidate for global crop initiatives. Potatoes are among the most bountiful, healthful and easy-to-grow crops on the planet. From South America to the northern plains of Europe, and in many parts of Africa, the potato flourishes. They are easy to grow in small plots of land in urban centers, where most of the world’s poorest populations dwell, making them an essential crop for people who need to feed their families or to sell at market for income. In both instances, when implemented properly, the poverty cycle could weaken by encouraging agricultural sustainability, improving nutrition and developing cooperative community planning. -By 2020, global demand for potato crops will have increased by 200%. 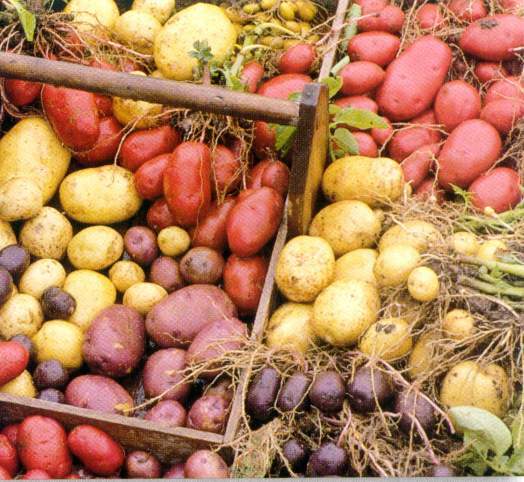 -Potatoes were first discovered 8000 years ago in Peru and were first grown as a crop by the Incas. -In the 1500s, the potato was brought from South America to Europe by Spanish explorers, which led to the wide proliferation of the potato in crops around the world. -China, India and Russia are the three largest producers of potatoes in the global market, followed by the United States and Canada. -Potatoes are high in carbohydrates (energy) and rich in vitamin C, and can be easily stored for long periods of time. Store potatoes in a cool well-ventilated area away from light in cardboard boxes or burlap sacks. When storing new and small potatoes, keep them in a refrigerator at 4 to 6°C (40 to 43°F). Under these conditions, you can store them for 2 weeks or longer. If potatoes are over exposed to light they will develop a green tinge, this should be trimmed off the potato as it should not be eaten. If potatoes are dropped more then 6 inches, they will bruise and turn into spoiled potatoes. Cool, dark storage is best since normal house temperatures can cause potatoes to deteriorate quickly. Potatoes breathe and perspire (lose water) so take them out of the plastic bag they come in and put them in a bin when storing. Before storing spuds, look them over and use any bruised ones first. Since dampness can cause decay, it is best not to wash spuds before storing. Avoid storing potatoes with onions or garlic since potatoes will pick up gases from the onion and garlic and the potato will deteriorate faster. We just discoverd our Microwave has a Potato setting. It makes perfect baked potato's. We have been eating a lot of them here lately! I never knew you could store potatoes in the refrigerator. Thanks for the tip! Hi there, Only the small potatoes (or "new" potatoes, as they're called) can be stored in the fridge. These ones are smaller than the average potato and have tight, thin skin (either a light beige or red) that does not have to be peeled. They are usually boiled with the skins on. Most other potatoes, like baking potatoes or russets, should be stored in a cool, dry pantry.